Design is the single most important factor in creating a successful photograph. The ability to see the potential for a strong picture and then organize the graphic elements into an effective, compelling composition has always been one of the key skills in making photographs. Digital photography has brought a new, exciting aspect to design - first because the instant feedback from a digital camera allows immediate appraisal and improvement; and second because image-editing tools make it possible to alter and enhance the design after the shutter has been pressed. This has had a profound effect on the way digital photographers take pictures. Now published in sixteen languages, The Photographer's Eye continues to speak to photographers everywhere. 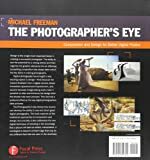 Reaching 100,000 copies in print in the US alone, and 300,000+ worldwide, it shows how anyone can develop the ability to see and shoot great digital photographs. The book explores all the traditional approaches to composition and design, but crucially, it also addresses the new digital technique of shooting in the knowledge that a picture will later be edited, manipulated, or montaged to result in a final image that may be very different from the one seen in the viewfinder.